INTERNATIONAL ART CONTEST WINNER. 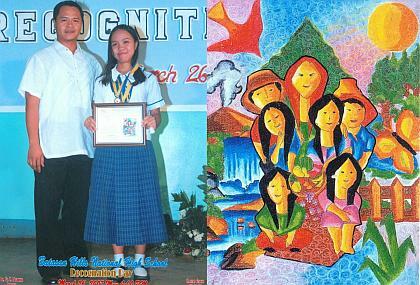 Dysiree Airee V. Abang of Batasan Hills National High School in Quezon City (shown above in photo with her Art teacher Nobel Pineda) shows the bronze prize certificate she won in the 14th World Children's Picture Contest in Japan. Her winning art piece bested some 45,978 entries from 68 countries worldwide. The contest was sponsored by the IE-NO-HIKARI Association, an organization dedicated to cultural enhancement and the promotion of international exchange of goodwill and understanding. Department of Education (DepEd) Secretary Jesli Lapus hailed Abang's triumph, adding that her success is a testimony to the world-class creativity of the Filipino.